To evaluate the feasibility of T1w-3D black-blood turbo spin echo (TSE) sequence with variable flip angles for the diagnosis of thoracic large vessel vasculitis (LVV). Thirty-five patients with LVV, diagnosed according to the current standard of reference, and 35 controls were imaged at 3.0T using 1.2 × 1.3 × 2.0 mm3 fat-suppressed, T1w-3D, modified Volumetric Isotropic TSE Acquisition (mVISTA) pre- and post-contrast. Applying a navigator and peripheral pulse unit triggering (PPU), the total scan time was 10–12 min. Thoracic aorta and subclavian and pulmonary arteries were evaluated for image quality (IQ), flow artefact intensity, diagnostic confidence, concentric wall thickening and contrast enhancement (CWT, CCE) using a 4-point scale. IQ was good in all examinations (3.25 ± 0.72) and good to excellent in 342 of 408 evaluated segments (83.8 %), while 84.1 % showed no or minor flow artefacts. The interobserver reproducibility for the identification of CCE and CWT was 0.969 and 0.971 (p < 0.001) with an average diagnostic confidence of 3.47 ± 0.64. CCE and CWT were strongly correlated (Cohen’s k = 0.87; P < 0.001) and significantly more frequent in the LVV-group (52.8 % vs. 1.0 %; 59.8 % vs. 2.4 %; P < 0.001). Navigated fat-suppressed T1w-3D black-blood MRI with PPU-triggering allows diagnosis of thoracic LVV. • Cross-sectional imaging is frequently applied in the diagnosis of LVV. • Navigated, PPU-triggered, T1w-3D mVISTA pre- and post contrast takes 10–12 min. 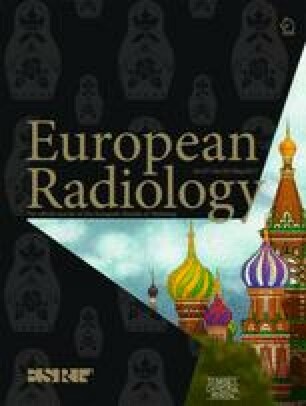 • In this prospective, single-centre study, T1w-3D mVISTA accurately depicted large thoracic vessels. • T1w-3D mVISTA visualized CWT/CCW as correlates of mural inflammation in LVV. • T1w-3D mVISTA might be an alternative diagnostic tool without ionizing radiation. The online version of this article (doi: 10.1007/s00330-016-4525-x) contains supplementary material, which is available to authorized users. The scientific guarantor of this publication is Prof. Dr. Tobias Saam. The authors of this manuscript declare relationships with the following companies: Dr. Hendrik Kooijman-Kurfuerst is a physicist, who works for Philips Healthcare. He modified the original VISTA sequence and so developed the mVISTA sequence. The other authors of this manuscript declare no relationships with any companies, whose products or services may be related to the subject matter of the article. The authors state that this work has not received any funding. One of the authors has significant statistical expertise. Institutional Review Board approval was obtained. Written informed consent was obtained from all subjects (patients) in this study. Some study subjects or cohorts have been previously reported at the RSNA Meeting 2014 and at the ISMRM meeting 2015. Pdf-versions of the corresponding power-point presentations are attached as supplemental material. The RSNA-presentation reports about 14 patients and 14 controls of the entire study cohort. The ISMRM-presentation includes the entire study cohort of 70 subjects. Methodology: prospective, case-control study, performed at one institution.